Jurors trying to decide the fate of a deaf motorist accused of plowing through a group of spectators watching the “Zombie Walk” parade in San Diego completed their first full day of deliberations Tuesday without reaching a verdict. Matthew Pocci, 47, faces three years in prison if convicted of felony reckless driving causing great bodily injury. 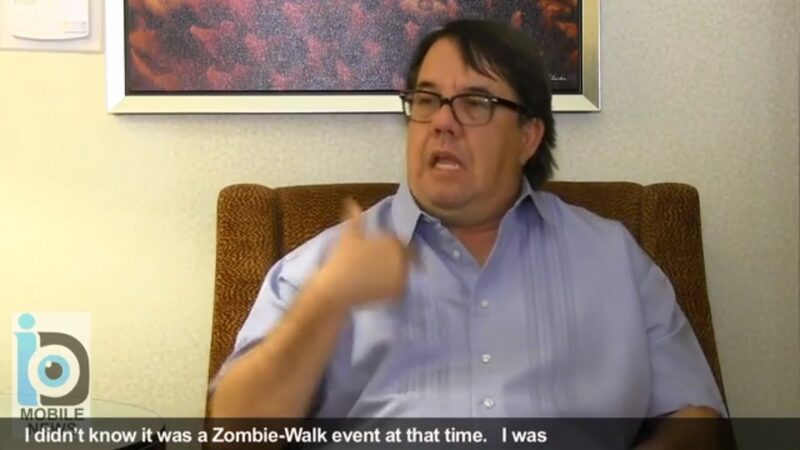 He testified that he was “very nervous” while waiting for pedestrians to move out of the way near Second and Island as he left the Comic-Con convention on July 26, 2014. Pocci said he started to worry when a crowd surrounded his car and people sat on the hood. Deputy District Attorney Anthony Campagna told jurors the defendant stopped for several minutes on Second Avenue, and even turned his engine off for a few moments, before honking his horn “loudly, aggressively” and driving into a group of onlookers, seriously injuring a woman. Defense attorney Ashby Sorensen said his client is unable to hear, as were two other adults in the vehicle. His client had attended the annual celebration of the popular arts at the San Diego Convention Center as a volunteer assisting deaf attendees, and had just left the center with his girlfriend, her son and her mother, the lawyer said. Campagna said spectators were lined up three-deep along Island Avenue to watch the march of Comic-Con attendees in Halloween-type costumes, including in Gaslamp Quarter intersections. It was clear that a parade was going on and that the defendant would have to wait, he said. Pocci drove off after running over the woman, breaking her arm, but stopped a couple of blocks later and contacted a police officer. He was not initially cited, but the District Attorney’s Office reviewed the case and in February sent the defendant a letter informing him of the felony charge.